Everyone loves having their minds tricked to beyond comprehension. It turns out animals aren’t very different when it comes to this. The only catch is while some of them are visibly confused by something they know shouldn’t be working but is happening in front of their eyes. Some of them get pretty sad and others so confused it’s almost as if they are accusing the magician of witchcraft. 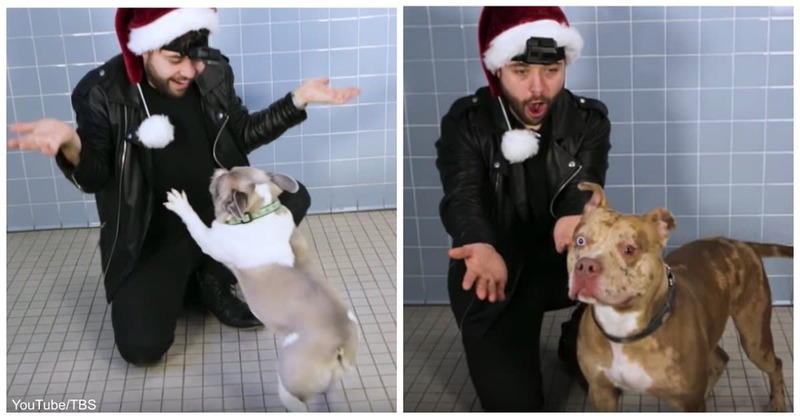 Over the holidays, a New York-based magician helped get these dogs new homes after their reactions got love from all corners of the country. John Stessel is a magician whose only greater love other than that for magic is his love for dogs. Being an illusionist in front of large crowds of people is exhilarating, but this time, he felt like trying something new – he wanted a new kind of audience. Why not put on a show for his furry friends? Together with a network executive from TBS, John headed over to a dog shelter in Hampstead, New York to start filming the short videos. He expected to elicit some reaction from the dogs, who have never met him before, but it was much more adorable and extreme than he would ever have thought. TBS posted the video of John, beginning in an empty room and later joined by a few dogs, performing tricks, each involving a treat. The video was meant to showcase how different the dogs are – all of them friendly, but each of them with a personality as different as we’d expect to see in humans. At the end of it, their reactions were unique. John was clad in his usual performance attire together with a Santa hat to showcase his Christmas spirit. As the dogs walk in, he calls to them, showing them a treat in between his fingers. The dogs, realizing what’s happening, approach him, but when they get close, the treat is magically gone. Some dogs remain in shock; others retreat in mild disappointment while others get closer, hoping to get the treat somehow back. Overall, the video is incredibly hilarious and adorable. At face value, it seems like a pretty cruel idea to promise dogs a treat and then make it disappear. For concerned readers and viewers, there’s nothing to worry about. After filming finished, John can be seen handing the dogs a non-disappearing treat, and lots of hugs and belly rubs followed. “They’re just like us. They want nothing other than being loved and the security of a gentle home,” John told news outlet, Dodo. “Each of them is pretty special, and I hope they can find a special home.” With any luck, and how viral the videos were over the holidays, his hard efforts won’t be for anything – the dogs are sure to find new forever homes soon. Who wouldn’t want to have such an incredible bundle of love in their homes, after all?